Golden sedum (Sedum kamtschaticum) is a fast-growing sedum often used as an attractive ground cover on dry, difficult slopes or banks. Each plant reaches a height of 9 inches, with a spread of up to 2 feet. During the summer, golden sedum is adorned with masses of tiny, bright yellow, star-shaped blooms. Golden sedum, suitable for growing in U.S. Department of Agriculture hardiness zones 4 to 9, has something to offer year-round, as the bright green foliage turns a shade of golden bronze during the winter months. Once planted, golden sedum requires virtually no maintenance. Plant golden sedum where the plant is exposed to bright sunlight. Golden sedum survives in partial shade, but the plant will be healthier and the colors brighter in full sunlight. While golden sedum tolerates poor soil, the soil must drain well. 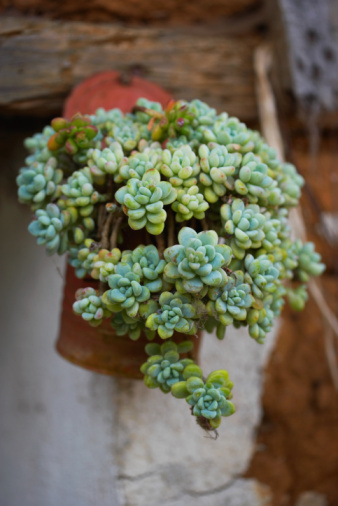 Like all succulents, sedum rots in soggy soil. To improve drainage, dig in 2 to 4 inches of compost or sand at planting time. Water golden sedum only during warm, dry periods, as an inch of moisture per week is plenty to keep the plant healthy. Provide the water once every week, then allow the soil to dry before watering again. Never allow the soil to remain wet. Feed golden sedum only once every year. Use a general-purpose granular fertilizer applied at a rate of one small handful of fertilizer for each plant. Always water immediately after applying fertilizer. Spread a 2-inch layer of mulch around each golden sedum plant, but apply the mulch carefully so the mulch doesn't come in contact with the foliage. Use a mulch such as shredded pine bark or dry grass clippings. Divide golden sedum every three to four years to keep the plant neat and to promote vigorous growth. To divide golden sedum, dig the plant with a garden fork or shovel, then pull the plant into smaller sections. Each small clump will root, as long as the clump has four or five shoots and a healthy root system. Prepare a sunny spot for the divisions ahead of time, then plant the divisions in the prepared spot immediately.